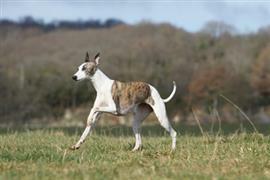 Being a member of the sighthound family, Whippets were bred for speed. Many owners choose fast names that can keep up with the pace of their dog. Supercars provide an excellent source of speed related names. Aston, Audi, Bentley, and Shelby are a few common vehicle themed dog names. A fun source of names can be found by turning the clock back on television. Many nostalgic names can be borrowed from sitcom stars of the 90’s. Elaine, Jackie, and Cosmo are names taken from ‘Seinfeld’. The ‘Friends’ series lends us names like Phoebe, Chandler, and Monica. Danny, Tanner, and Becky are star characters from ‘Full House’. Other fun names can be found by exploring the phrase “Whip It” which sounds similar to the name of the breed. In 2009, Fox Searchlight released a roller derby movie titled ‘Whip It’ under the direction of Drew Barrymore. Dog name ideas taken from characters in the film include Corbi, Amber, Shania, and Colby. Devo is another good option taken from the band that wrote the 80’s hit song “Whip It”. Some of our pages will contain a subcategory. A subcategory is a slightly more specific grouping than the main topic of the page. For a subcategory, we will include a separated table of names and corresponding descriptions. An example of a subcategory of Red Dog Names would be 'Dog Names Inspired by Red Wines'. If you have any subcategory ideas for the Whippet Names page, we would love to hear them. Use the form below to submit your ideas.